Once we got a dose of the single titled “Oopsy Daisy,” we immediately got a hunch there was much more to come from the duo. Especially with the abundance of potent musical chemistry which exists between Lastee and CrownedYung. Well, they have simply taken that feat unto new heights and extents with an entire feast which the “BlackOut Album” is. On this latest outing, they bring together 11 stunning tracks with the support of some of the game’s finest cats and usual collaborators. 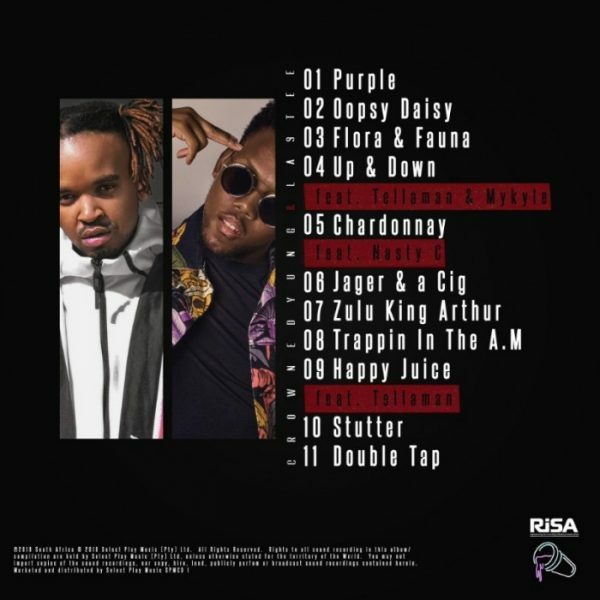 The “BlackOut Album” features Nasty C, Tellaman and Mykyle; with the trio bringing further wave and breeze to an already scorching body of work. In the end, we can go on and on about the vocals of Lastee as well as the lyrical delivery which CrownYung brings to bare on this strategic partnership. However, for one outing that packs all the hallmarks and ingredients of a classic, we wouldn’t want to be the spoiler of something great. Just know you can expect the abundance of lyrical grind, the superb deliveries, a spree of glittering production and the superb overall that is addictive and dope. Simply cope a dose, then be sure to share your thoughts and opinion in the comments section below.